Vintage mail order sewing pattern for Misses' dress. The yokes and sleeves are cut-in-one. Two piece skirt attached a waistline has patch pockets. Bust 40; Hip 43. No waist measurement listed. Pattern is unused and complete. 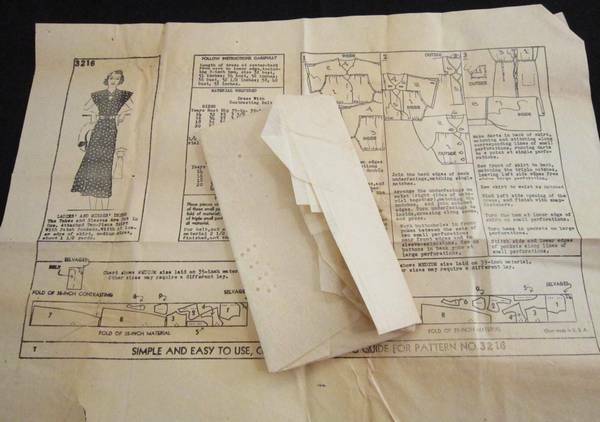 The pattern pieces are in original folds in excellent condition. Instruction has age toning and some wrinkling and is complete. Unprinted, precut pattern pieces has perforations for identification. Since this was a mail order sewing pattern their is no traditional envelope/sleeve.